Looking for August 2019 Orlando flights? We have fares for British Airways, Virgin, BA and United. Call us on 01934 319 851 today for our best price on August 2019 Florida flights. Combine with fully insured car-hire and your choice of accommodation. ATOL and ABTA protected. How much are you expecting to pay for your August 2019 Florida flights? Prices of over £1000 per seat are common. Follow the advice below and you could achieve fares of £650 per adult and £500 per child – even on peak dates. Can you wait until the last week of August? The shoulder season kicks in towards the end of the month – leave late August and return early September for a big saving. Planning to fly in the third week of August? Both direct and indirect flights are better value than early August. Need to leave in the first two weeks of August? The best option is an indirect flight from Heathrow. One change en route adds a couple of hours to the journey, but savings can be substantial. For further savings, avoid the weekends. Aim for a mid-week departure (ideally on a Tuesday or Wednesday) for the best value August 2019 Florida flights. Avoid direct flights on peak dates; indirect flights are much more economical. Heathrow has the most departures, so prices tend to be very competitive. A great-value August fare is possible even on peak dates if you depart from Heathrow mid‑week. Manchester, Edinburgh and Glasgow also offer excellent fares if you’re prepared to fly indirect. 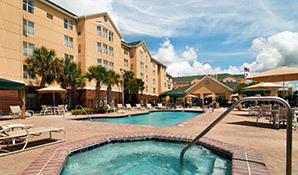 We typically obtain very good fares to Orlando International. Occasionally, Tampa Airport is more economical. The drive to your accommodation takes a little longer, but the savings can be worthwhile. If you’d rather fly from your local airport, we book connecting flights for a supplement. Aberdeen, Exeter, Newquay, Isle of Man, Jersey and Belfast all have convenient connection times. We don’t compromise on quality – we book our Florida flights with reputable airlines including British Airways, Virgin and United. We achieve great-value Orlando flights by monitoring prices and booking seats at the best fare. August 2019 Orlando flights will be released in September 2018, but we won’t necessarily book them immediately. We’ll check prices daily until a good fare is available. We’re already taking bookings for August 2019 Orlando flights. An August 2019 Florida fly-drive can be even better value. Combine your August 2019 Orlando flights with either a car or a hotel for a rock-bottom package rate. All our August 2019 Florida flights and holidays are ABTA and ATOL protected. Book today with a deposit of just £100 per person. Fill out an enquiry form or, even better, call Alex on 07944 584 659.